Aaron Josef Hernandez[upper-alpha 1] (born November 6, 1989) is a former American football tight end and convicted murderer. Hernandez played college football for the University of Florida, where he was a member of a BCS National Championship team and was recognized as an All-American. He was drafted by the New England Patriots in the fourth round of the 2010 NFL Draft. Hernandez was released by the Patriots in June 2013 immediately after his arrest for the murder of Odin Lloyd. On August 22, 2013, Hernandez was indicted by a grand jury for the murder of Odin Lloyd, a semi-professional football player, in June 2013. On May 15, 2014, Hernandez was indicted for the 2012 double homicide of Daniel de Abreu and Safiro Furtado. On April 15, 2015, he was found guilty of first-degree murder in the Lloyd case, and is serving a sentence of life in prison without the possibility of parole at the Souza-Baranowski Correctional Center. Aaron Hernandez was born in Bristol, Connecticut, to Dennis Hernandez, who was of Puerto Rican descent, and Terri Valentine-Hernandez, who is of Italian descent. Dennis died from complications from hernia surgery in January 2006, when Aaron was 16. In December 2011, Hernandez was named a Pro Bowl alternate during the season. In the NFL playoffs, Hernandez had the longest run of the postseason, a 42-yard run against the Broncos on the Patriots' first offensive drive of the game. Hernandez helped lead the Patriots to Super Bowl XLVI, scoring a touchdown during the game, but the Patriots lost to the Giants 21-17. Although Hernandez's stats were eclipsed by Gronkowski, Hernandez still ranked in the top 5 in receptions, yards, and touchdowns among tight ends. According to NBC Sports, Hernandez and Gronkowski were the first pair of tight ends in NFL history to catch at least five touchdowns each in consecutive seasons for the same team. Both ranked in the top 20 among all receivers in number of catches. In 2011 they also set NFL records for yardage, receptions, and touchdowns by tight ends on one team, combining for 169 receptions, 2,237 yards, and 24 touchdowns. The previous records for receptions and yards by multiple tight ends on a single team was set in 1984 by the San Diego Chargers, who had four tight ends combine for 163 receptions and 1,927 yards; the 24 touchdowns eclipsed the record of 18 touchdowns caught by Gronkowski, Hernandez, and Alge Crumpler in 2010. Aaron Hernandez began dating Shayanna Jenkins in 2007. They have a daughter, Avielle Janelle, who was born in November 2012. That same month, Hernandez purchased a 7,100 square feet (660 m2) four-story home, with an in-ground pool, in North Attleboro, Massachusetts, for $1.3 million. On September 30, 2007, five shots were fired into a car containing Randall Carson, Justin Glass, and Corey Smith while they were waiting at a Gainesville stoplight after having left a nightclub. Carson, a passenger sitting in the back seat who was uninjured, told police that the shooter was a "Hawaiian" or "Hispanic" male with a large build weighing about 230 pounds with a lot of tattoos. Glass, the driver, was shot in the arm, and Smith was shot in the back of the head and still suffers seizures as a result of the shooting. Hernandez invoked his right to counsel and refused to talk to police, and no charges were filed at the time. However, due to his 2013 arrest and subsequent conviction for the murder of Odin Lloyd, Massachusetts authorities have reached out to police in Florida to determine whether Hernandez may have had a role in the 2007 shooting. On June 20, 2013, the Boston Herald reported the Patriots had "barred" Hernandez from Gillette Stadium. According to NFL.com, Patriots owner Robert Kraft decided to have Patriots staff ask Hernandez to leave because he did not want Gillette to be "the site of a media stakeout". However, the Boston Globe reported that Kraft, head coach Bill Belichick (who is also effectively the Patriots' general manager) and the rest of the team's brain trust had decided to cut ties with Hernandez if he were arrested on any charge related to the case, even an obstruction of justice charge. Reportedly, this decision was made a week before Hernandez' arrest. On April 15, 2015, Hernandez was found guilty of murder in the first degree, a charge that in Massachusetts automatically carries a sentence of life in prison without a possibility of parole, as well as five firearm charges. Hernandez did not face the death penalty, as the Commonwealth of Massachusetts abolished the death penalty in 1984. Immediately following the conviction, Hernandez was temporarily transferred to the Massachusetts Correctional Institution – Cedar Junction, a maximum security intake facility located only 1.5 miles from Gillette Stadium where he formerly played, to begin serving his sentence. He was transferred to serve the remainder of his life sentence at the Souza-Baranowski Correctional Center, a maximum security facility adjacent to the medium security Massachusetts Correctional Institution – Shirley. Since Hernandez had not completed his fourth season in the league, the Patriots were required to place him on waivers after releasing him. However, he went unclaimed. After Hernandez cleared waivers on June 28, NFL commissioner Roger Goodell announced that, while charges against Hernandez are pending, the NFL will not approve any contract signed by Hernandez until Goodell holds a hearing to determine if Hernandez should face suspension "or other action" under the league's Personal Conduct Policy. ↑ Hernandez's proper full name is Aaron Josef Hernandez, but this has been misreported as Aaron Michael Hernandez. ↑ "Defendant's Motion for Issuance of Pretrial Subpoena" (PDF). June 12, 2014. Retrieved May 5, 2015. ↑ "Bristol Central High School Class Of 2007". Hartford Courant. June 20, 2007. Retrieved May 5, 2015. ↑ "Aaron Hernandez Fast Facts". CNN. April 28, 2015. Retrieved May 4, 2015. ↑ "Aaron Hernandez indicted in death of semi-pro football player". WCVB-TV. August 22, 2013. Archived from the original on April 8, 2014. Retrieved August 22, 2013. ↑ "Aaron Hernandez guilty of murder in death of Odin Lloyd". Retrieved April 15, 2015. ↑ Pro-Football-Reference.com, Players, Aaron Hernandez. Retrieved May 6, 2011. ↑ Varela, Julio Ricardo (June 27, 2013). "Death of Aaron Hernandez's dad in 2006 deeply impacted his life". NBC Latino. 1 2 Whiteside, Kelly (October 11, 2009). "Florida tight end Hernandez honors father's memory". USA Today. Retrieved June 20, 2013. ↑ Reynolds, Bill (October 22, 2011). "Brown's D.J. Hernandez serves as role model for Pat's Aaron". The Providence Journal. Archived from the original on November 1, 2013. Retrieved April 19, 2015. 1 2 GatorZone.com, Football History, 2009 Roster, Aaron Hernandez. Retrieved May 6, 2011. ↑ "2007 Football Recruiting – Tight Ends". Scout.com. Retrieved April 28, 2010. 1 2 2011 Florida Gators Football Media Guide, University Athletic Association, Gainesville, Florida, pp. 74, 81, 89, 95, 97, 101, 143–145, 162, 182 (2011). Retrieved August 29, 2011. ↑ "Florida rides Tebow, suffocating defense to another BCS title". ESPN.com. Associated Press. January 8, 2009. Retrieved April 28, 2010. ↑ "Florida Gators All-American TE Aaron Hernandez entering draft". ESPN.com. Associated Press. January 6, 2010. Retrieved April 28, 2010. ↑ "Aaron Hernandez Combine Profile". NFL.com. Archived from the original on April 11, 2010. Retrieved April 28, 2010. ↑ Breer, Albert R. (April 27, 2010). "Hernandez has history of drug use". The Boston Globe. Archived from the original on April 28, 2010. Retrieved April 28, 2010. ↑ Breer, Albert R. (April 28, 2010). "Hernandez says he failed one test". The Boston Globe. Archived from the original on April 30, 2010. Retrieved April 28, 2010. ↑ Reiss, Mike (June 8, 2010). "Patriots sign draft pick Hernandez". ESPNBoston.com. Archived from the original on June 13, 2010. Retrieved June 8, 2010. ↑ Reiss, Mike (July 25, 2006). "Extra points". The Boston Globe. ↑ Breer, Albert (June 9, 2010). "Patriots play cautious on Hernandez deal". The Boston Globe. Archived from the original on June 12, 2010. Retrieved July 17, 2010. ↑ Rodak, Mike (July 30, 2011). "Aaron Hernandez relinquishes No. 85". ESPN Boston. Retrieved June 30, 2013. ↑ Farinella, Mark. "Pats won't be showing Hernandez the money". The Sun Chronicle. North Attleboro, MA. Retrieved June 30, 2013. ↑ "Patriots' Hernandez Suffers High Ankle Sprain vs. Cardinals". CBS Boston. September 16, 2012. Retrieved June 24, 2013. ↑ "Patriots stomp Texans 42-14 on Monday Night Football". CBS News. December 10, 2012. Retrieved June 24, 2013. ↑ Bedard, Greg A. (August 27, 2012). "Aaron Hernandez deal worth up to $40 million". Boston.com. Retrieved June 20, 2013. ↑ "New England Patriots' Rob Gronkowski, Aaron Hernandez making tight end history". ESPN Boston. January 19, 2012. Retrieved June 20, 2013. ↑ Barrabi, Thomas (June 27, 2013). "Aaron Hernandez Girlfriend: Will Shayanna Jenkins Testify In Odin Lloyd Murder Investigation?". International Business Times. Retrieved June 29, 2013. ↑ McLaughlin, Tim (June 21, 2013). "Police seek arrest of NFL's Hernandez in murder probe: official". Reuters. Retrieved June 29, 2013. ↑ Bachman, Rachel (July 2, 2013). "Tebow Tried to Intervene in Hernandez Bar Fight". The Wall Street Journal. Retrieved April 15, 2015. ↑ Solotaroff, Paul; Borges, Ron (August 28, 2013). "The Gangster in the Huddle". Rolling Stone. Retrieved April 15, 2015. ↑ Naqi, Kelly (July 3, 2013). "Hernandez role in '07 shooting probed". ESPN. ↑ "Aaron Hernandez investigated for 2012 double murder". CNN. June 27, 2013. ↑ "Boston police search Aaron Hernandez home". CBS News. June 28, 2013. Retrieved July 5, 2013. ↑ "Aaron Hernandez indicted in 2012 Boston double homicide". WCVB. May 15, 2014. Retrieved May 15, 2014. ↑ Cline, Seth (May 15, 2014). "Aaron Hernandez Indicted for Double Murder Prior to 2012 Season". U.S. News & World Report. Retrieved May 16, 2014. ↑ "NFL Player Charged With Murder: Who Is Suspect Aaron Hernandez? Former New England Patriot Appears In Court, Pleads Not Guilty". International Business Times. ↑ "Report: Pats' Hernandez shot man in eye back in February". WPRI-TV. ↑ "Aaron Hernandez Sued -- NFL Star Shot Me in the Face". Retrieved June 27, 2013. ↑ "Report: Hernandez recently was sued for allegedly shooting someone in the face". NBC. Retrieved June 27, 2013. ↑ "Aaron Hernandez charged with witness intimidation in connection to 2012 Boston killings". Associated Press. May 11, 2015. ↑ Schilken, Chuck (May 11, 2015). "Aaron Hernandez is charged with witness intimidation in 2013 shooting". Los Angeles Times. ↑ Schwab, Frank (May 11, 2015). "Former Patriots tight end Aaron Hernandez indicted for witness intimidation". Yahoo Sports. Retrieved May 11, 2015. ↑ Smith, Michelle R. (June 26, 2013). "Pro football player Hernandez charged with murder". Associated Press. Retrieved June 26, 2013. ↑ "Aaron Hernandez questioned in connection with North Attleboro murder". Arlington VA: WJLA. June 20, 2013. Retrieved June 21, 2013. ↑ McIntyre, Brian (June 20, 2013). "Report: Police believe Aaron Hernandez destroyed surveillance system, cellphone". Yahoo! Sports. Retrieved June 24, 2013. ↑ "Source: Aaron Hernandez barred by Patriots". Boston Herald. June 21, 2013. Archived from the original on June 24, 2013. ↑ "Why Aaron Hernandez was asked to leave Patriots facility". NFL.com. June 21, 2013. Retrieved June 24, 2013. 1 2 Volin, Ben (June 27, 2013). "Patriots quickly ran out of patience with Aaron Hernandez". The Boston Globe. Retrieved June 28, 2013. ↑ "Aaron Hernandez in police custody". ESPN. June 26, 2013. Retrieved June 26, 2013. ↑ "Patriots Release Tight End Aaron Hernandez" (Press release). New England Patriots. June 26, 2013. Retrieved April 19, 2015. ↑ "Ex-NFL player Aaron Hernandez convicted of 1st-degree murder". Retrieved April 15, 2015. ↑ "Aaron Hernandez Found Guilty of First-Degree Murder". Retrieved April 15, 2015. ↑ "Former New England Patriot's star Aaron Hernandez charged with murder". Boston: WCVB. June 26, 2013. Retrieved June 26, 2013. ↑ "Aaron Hernandez due back in court for Odin Lloyd murder case". CBS News. June 27, 2013. Archived from the original on March 6, 2014. Retrieved July 5, 2013. ↑ "Man wanted in connection to Lloyd murder arrested in Fla.". Fox News. Retrieved June 28, 2013. ↑ "Aaron Hernandez Case: Victim's Sister Says Killing Like 'A Bad Dream'". ABC News. June 28, 2013. Retrieved July 5, 2013. ↑ "Hernandez's Apartment Is Searched by Police". The New York Times. The Associated Press. July 3, 2013. ISSN 0362-4331. Retrieved July 4, 2013. ↑ "Aaron Hernandez indicted in death of semi-pro football player". WVCB TV. Retrieved August 22, 2013. ↑ "Hernandez pleads not guilty to murder indictment". NY Post. Retrieved September 7, 2013. ↑ "Aaron Hernandez's Girlfriend Shayanna Jenkins Indicted On Perjury Charge". CBS News Boston. Retrieved September 27, 2013. ↑ Candiotti, Susan (April 15, 2015). "Aaron Hernandez guilty of murder". CNN. Retrieved April 15, 2015. ↑ Mather, Victor (April 15, 2015). "Aaron Hernandez Found Guilty of First-Degree Murder". New York Times. Retrieved April 15, 2015. ↑ "Patriots Player Aaron Hernandez Charged with First Degree Murder". Extratv.com. June 26, 2012. Retrieved June 27, 2013. ↑ "States with and without the death penalty". Death Penalty Information Center. Retrieved January 30, 2015. ↑ Rosenthal, Seth (April 15, 2015). "Aaron Hernandez will spend life in prison about 2 miles from the Patriots stadium". SB Nation. ↑ Smith, Michelle R. (April 15, 2015). "Ex-NFL star Hernandez convicted of murder, sentenced to life". Associated Press. 1 2 Volin, Ben (June 28, 2013). "Patriots were 'taken aback' by murder charge". The Boston Globe. ↑ "NFL: No team can sign Hernandez without Goodell's approval". CBS Sports. ↑ "CytoSport, Makers of Muscle Milk, Terminate Endorsement Deal with Aaron Hernandez". NESN. ↑ "Puma drops NFL player Hernandez after murder charge". Reuters. June 28, 2013. ↑ Wolken, Dan; Schrotenboer, Brent (June 26, 2013). "Puma drops Aaron Hernandez as product endorser". USA Today. ↑ DelVecchio, Steve (July 8, 2013). "EA Sports: Aaron Hernandez dropped from video games". Larry Brown Sports. Retrieved July 8, 2013. ↑ Scott, Nate (July 14, 2013). "Football Hall of Fame removes photo of Aaron Hernandez". USA Today. ↑ Rovell, Darren (July 18, 2013). "Aaron Hernandez stickers removed". ESPN. Retrieved July 18, 2013. 1 2 "Aaron Hernandez's All-American Brick Removed From Outside Florida Gators' Stadium". New England Sports Network. July 25, 2013. Retrieved January 30, 2015. ↑ "Hernandez Merchandise Pulled From Patriots Pro Shop, Fans React". CBS Boston. June 26, 2013. Retrieved July 5, 2013. ↑ Reiss, Mike. "Kraft breaks silence on Hernandez". ESPN Boston. Retrieved August 7, 2013. 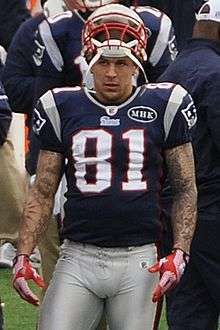 Wikimedia Commons has media related to Aaron Hernandez.